At Lubron UK, we understand the unique requirements of the healthcare sector. We understand the need for durability and reliability in our products and services, and apply our knowledge and expertise to provide our customers with compliant equipment that we consider to be the markets best healthcare water treatment systems for hospitals and clinics, throughout the country. 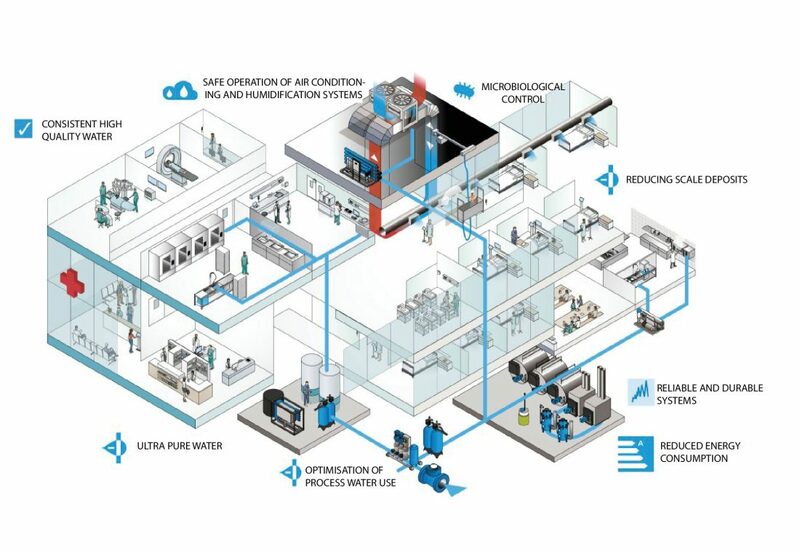 Lubron has a first-class reputation for providing fully compliant healthcare water treatment systems for hospitals, clinics, pathology laboratories, and the for the pharmaceutical industry, from clinical decontamination and the water used in renal dialysis, to heating and chilled water systems. The fact that water treatment systems for these sectors must be technically advanced, and utterly reliable, to protect human life, and to meet exacting standards is forefront in Lubron’s delivery. Treatment for renal conditions will always be a major requirement for any modern healthcare service. Renal dialysis water requirements are well established and Lubron’s technical team bring high levels of expertise and experience to system design, supply, aftercare support and maintenance of well engineered water purification systems. Whether it is in hospitals, nursing homes or care homes, we understand that it is essential for our healthcare customers to have complete confidence in the quality of their water. With the correct water treatment, the risks of deposits, clogging and bacteria spreading in the system are minimised, and the service life is extended. Known for its excellent service, Lubron’s maintenance provision for our customers is world-class. Our extensive service network provides 24/7 support for our clients. cation systems and equipment represent a potential source of transmission of viruses and bacteria, including legionella. By using demineralised water to sterilise equipment, health risks can be negated. Lubron’s water treatment specialists understand the challenges, have extensive knowledge of legislation and regulations and can specify the appropriate technology to deliver the best performance for every environment. Tap water in the UK includes a number of components that have an impact on, for example, conductivity. Quality standards in laboratories and pharmacies are naturally very high, as they are for cleaning equipment in the CSSD (Central Sterile Services Department). With the right water treatment, Lubron provides demineralised water of the highest quality for each specific application. Improving energy efficiency is key to any organisation, and particularly in healthcare. Heating costs represent a significant share of energy consumption in healthcare. A sustainable building relies on efficient cooling and heating systems. With the correct water treatment, heat transfer can remain optimal for longer, resulting in fiscal savings and a reduced carbon footprint. Depending on water quality requirements, a number of techniques can be applied in the clinical and healthcare sector. Water purity plays an important role here too, in helping to limit the risk from air and water borne infections. Lubron has invested in the research and development of specially designed units which deliver the finely controlled humidification, so important in providing the right environment in theatres, wards and offices across healthcare facilities. Filtration occurs in nature when rain water passes between many layers of sand and gravel. The gravel and sand act as a filter to collect solid particles and therefore leave the water pure. This process has been adapted to achieve the same effect in industry and is particularly useful in healthcare, manufacturing and domestic circumstances. Maintaining compliance with HTM 04-01 is challenging for any healthcare management team; Lubron provides quality solutions that represent long-term reliability and value for money to over 60% of the UK’s hospitals. Whether you require our consultancy services, chemical treatment products or water treatment equipment, the experienced team at Lubron can help you to exceed your compliance objectives and mitigate risk.